Posted in: BSU Journal Club. 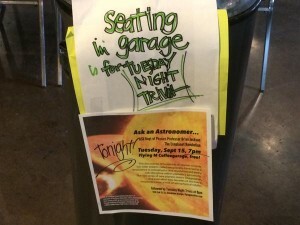 Tagged: Boise State Observatory, exoplanet transit, exoplanets. As part of rich tapestry of American astronomy, lots of universities across the US have small but highly serviceable observatories, with histories going back many decades. For instance, Boise State’s own on-campus observatory was installed in the late 70s, and although it’s hardy and still functional, like a lot of these observatories, it lacks capabilities that would allow its use as an active research facility. Such small, older facilities have primarily been used for outreach and teaching, rather than up-to-date research. In the last few years, tremendous improvements in hardware and software have dramatically reduced the costs and expanded the availability of research-grade instrumentation and computational capabilities. Many of these observatories are now roaring to life and contributing to research efforts at the razor-edge of astronomy – characterizing new exoplanets, contributing to rapid-response gamma-ray burst surveys, among other projects. 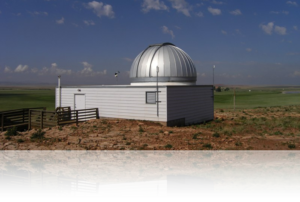 However, the process of upgrading these observatories is challenging, as we’ve discovered in trying to refurbish Boise State’s observatory, and there is not a lot of guidance out there about best practices. Recently, David Kasper of University of Wyoming Physics and Astronomy led an effort to automate Wyoming’s Red Buttes Observatory (RBO), located about 15 miles south of Laramie. Thankfully, he documented their work in a paper published late last year. The paper provides lots of very specific technical details and even the source code the group used to make RBO a facility capable of supporting undergraduate and graduate research. For instance, RBO’s new weather station determines meteorological conditions at the observatory and posts them, every 60-s, to a public website. Automated monitoring of these conditions allows the observatory itself to decide whether the weather is conducive to observing and even to close up the dome in the case of inclement weather. The new observatory has collected transit observations of hot Jupiters, a project right up my alley. And so, their work will provide an important roadmap for Boise State’s efforts to renew our observatory. We hope, soon, to see the shadows of distant worlds right from downtown Boise. If you’d like to donate to help with refurbishing our observatory, please visit this website. Posted in: BSU Journal Club. Tagged: exoplanet, exoplanet transit, trappist-1. Unless you were living under a very large and heavy rock last week, you probably heard about the discovery of seven planets in the TRAPPIST-1 system by Michaël Gillon and colleagues. Although this system was already known to host three, roughly Earth-sized transiting planets, the discovery of four more throws the door wide open for habitability – all seven planets receive the right amount of starlight from their diminutive red-dwarf host that liquid water might be stable on their surfaces. There are so many interesting questions to explore for this system – What are the planets’ atmospheres like? How did this system of tightly-packed planets form and how do their orbits remain stable? And, of course, are they habitable? Fortunately, concerted follow-up observations and theoretical studies can probably a lot of these questions. The fact that the planets all transit their small host star means their atmospheres are ideal for study by the James Webb Space Telescope. Strong gravitational tugs among the planets caused their orbits to change visibly over the course of the observations, so we have strong constraints on how exactly the planets interact. The last and probably most important question is going to be a lot more difficult to answer. But since a detailed understanding of this system is likely (and probably inevitable, given the enormous enthusiasm for this system), we’ll soon be very close to answering the question of whether the TRAPPIST-1 system is habitable and maybe even inhabited. 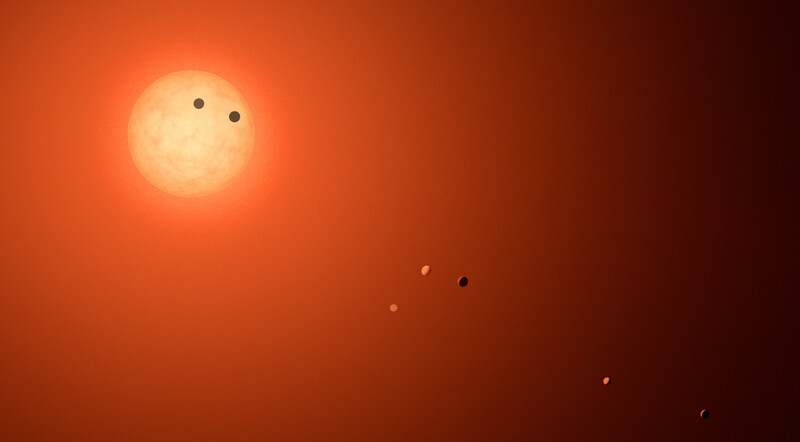 One bit of trivia: the TRAPPIST survey that discovered this system was named in honor of the contemplative Roman Catholic religious order of Trappists, and the astronomers reportedly celebrated their discovery with a round of Trappist beer. Maybe this should be the start of a new tradition of naming new planetary systems after beers. Posted in: Meetings, Uncategorized. Tagged: aas 229, exoplanet transit, exoplanets. A very active and engaging morning session on detecting exoplanets via the transit method on AAS 229 Day 1. Lots of good talks (although all of the talks were by male astronomers) and probing but polite questions (again, mostly by male astronomers – interesting study on these trends here). A few talks stuck out in my mind. Aaron Rizzuto from UT Austin looked for transiting planets in stellar clusters spanning a range of ages using data from the K2 Mission and found there seem to be fewer hot Jupiters in clusters 10 million years old than there are in older (hundreds of millions of years old) clusters. He suggested that this may mean it takes 100s of millions of years for the migration that makes hot Jupiters to take place. That would probably rule out one standard model for making hot Jupiters, namely gas disk migration, since that probably takes place within a few 10s of millions of years. 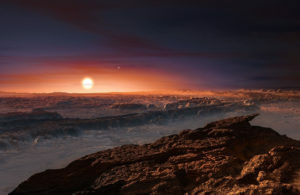 Dave Kipping of Columbia University discussed his search for transits of Proxima b, the recently discovered, Earth-sized planet just four light years from Earth. Unfortunately, the host star, Proxima, is a highly variable star due to almost constant flaring. As a result, it would be very difficult to see the planet’s transit – as Kipping said, it requires wading through “a sea of variability”. However, Kipping and his group struggled valiantly to recover the transit using data from the Canadian MOST satellite, and it looks like the planet just does not transit. So we probably won’t know the planet’s radius (at least not for a long time). Bummer. The last talk of the session was from George Ricker, the PI of the TESS mission, the follow-up mission to Kepler, about TESS’s status and prospects. Apparently, the mission will observe more than 2 million stars! Orbiting many of those stars will be nearby habitable planets, and Ricker showed an amazing simulation of where those stars might be found (courtesy of Zach Berta-Thompson of UC Boulder), a still from which is shown below. Posted in: Brian's publications. 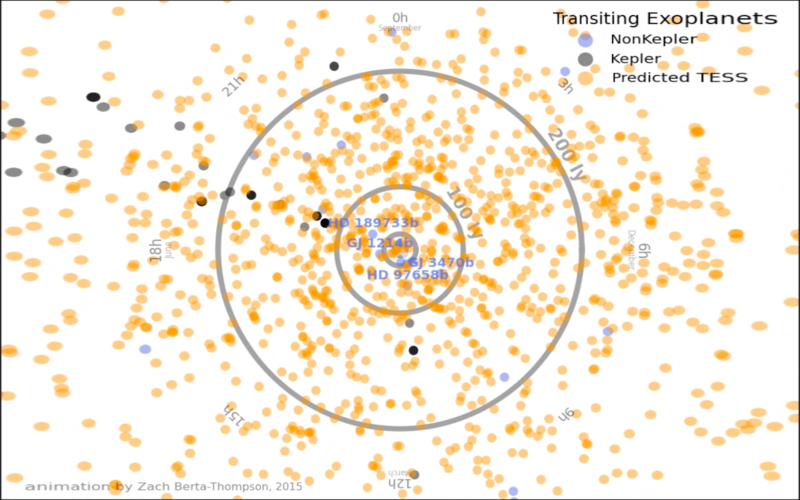 Tagged: close-in exoplanets, exoplanet transit, exoplanets, K2 mission. Twelve multi-planet systems where the innermost member is very close to the host star, that is, has an orbital period less than 1 day. From Adams et al. (2016). Big research news today: our research group SuPerPiG, led by the inimitable Dr. Elisabeth Adams, announced the discovery of two new planets, EPIC 220674823 b and c.
Using data from the K2 Mission, we found these planets by looking for the shadows of the planets as they passed in front of their host stars, a planet-hunting technique known as the transit method. These new planets are very different from planets in our solar system in several surprising ways. First, they’re both bigger than Earth but smaller than Neptune – planet b is 50% larger, and planet c is 2.5 times larger. They inhabit a strange nether-region of planets where they’re known as super-Earths or sub-Neptunes, planets somewhere between Earth and Neptune. The reason there’s no specific name for such planets is because astronomers don’t understand this new class of planet at all. An artist’s conception of CoRoT-7 b, another ultra-short-period planet. Second, both planets are MUCH closer to their Sun than the planets in our solar system. In fact, planet b is so close to its sun that it takes less time to orbit (14 hours) than all the playtime it took the Cubs to go from 3 games down to tying up the World Series. By comparison, planet c circles at the glacial pace of once every 13 days. Another thing that’s interesting about our planets: they’re yet another system of with an ultra-short-period planet (USP) in which there is more than one planet, i.e. a multi-planet system. In fact, as we argue in our paper, most of the known systems with ultra-short-period planets are probably multi-planet systems and that fact might help explain the origin of these chthonic planets. Posted in: Brian's Presentations. 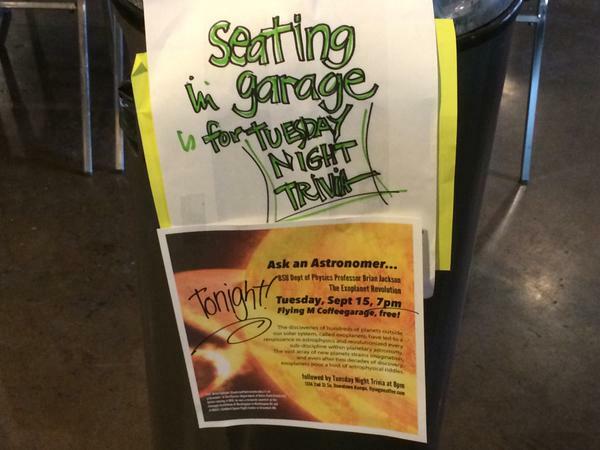 Tagged: astronomy, exoplanet transit, exoplanets, public outreach. I gave a talk at Boise State’s Osher Lifelong Learning Institute on exoplanets generally and my group’s research specifically. The crowd was really amazing. Despite my being delayed by a flat bike tire, there was an enormous group of enthusiastic astrophiles waiting for me when I arrived. We toured the night sky briefly using the stellarium program, a free (but please donate) and open-source night sky simulator available here — http://stellarium.org/. I made quite a long talk to fill the two-hour scheduled slot, but there were so many interesting questions, I barely made it halfway through. I’ve posted my abstract and presentation below in case there’s any interest. The discoveries of hundreds of planets outside our solar system, called exoplanets, have led to a renaissance in astrophysics and revolutionized every sub-discipline within planetary astronomy. The vast array of new planets strains imagination, and even after two decades of discovery, exoplanets pose a host of astrophysical riddles. In this presentation, I’ll describe how these distant worlds have revised our picture of planet formation and evolution. I’ll also discuss outstanding questions in planetary astrophysics and prospects for observational work, including the TESS mission, selected by NASA for a 2017 launch to find more, nearby planets. Posted in: Journal Club. Tagged: close-in exoplanets, exoplanet transit, K2 mission. 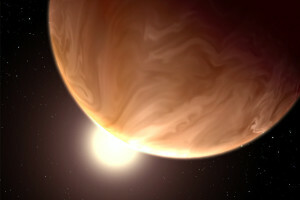 Artist’s conception of cloudy GJ 1214 b. From http://www.nytimes.com/2014/01/07/science/space/the-forecast-on-gj-1214b-extremely-cloudy.html. At journal club this week, we discussed the recent discovery using data from the K2 mission of the sub-Neptune planet K2-28. 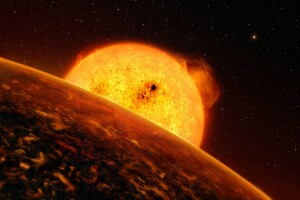 The authors of the discovery paper point out that this planet is similar in many ways to another famous planet, GJ 1214 b. Like GJ 1214 b, K2-28 b is member of this puzzling but ubiquitous class of sub-Neptune planets — planets that fall somewhere between the Earth and Neptune in size and composition and do not exist in our solar system*. Both planets also orbit relatively nearby M-dwarfs, which means, like GJ 1214 b, K2-28 b might be amenable to follow-up observations. Previous follow-up observations of GJ 1214 b indicated that planet’s atmosphere is very cloudy or hazy. So K2-28 b could provide another very important toehold along the road toward understanding this strange class of hybrid planet. Posted in: Brian's Presentations, Public Outreach. Tagged: astronomy, exoplanet transit, exoplanets. Had a great time last night at Flying M Coffee in Nampa. I gave a short talk about my research and recent developments in exoplanet astronomy. Then I opened the floor up for questions — the best part of the night. Lots of really great questions about alien life, what exoplanets are like, when will we find life. One question that stood out for me was asked by a young woman about how we study the composition of exoplanet atmospheres. I talked about the promise of the James Webb Space Telescope to measure transits in different colors. And there was a moment of genuine awe and surprise I could see on her face. It was really great. As of this writing, our campaign has broken $1600 — very exciting. Thanks to Cindy Hall and April and Seth Masarik for their support. Posted in: BSU Journal Club, Uncategorized. Tagged: astronomy, CoRoT mission, exoplanet transit, exoplanets. At journal club, we discussed the discovery of two new hot Jupiters using data from ESA‘s CoRoT mission, with the names CoRoT-28 b and -29 b. Both systems seem a little off. The host star CoRoT-28 has an inflated radius, suggesting it is ancient and on its way off the main sequence. But it has a lot more lithium than we’d expect for an old star, and its rotation rate is similar to the Sun’s, much faster than we would expect. 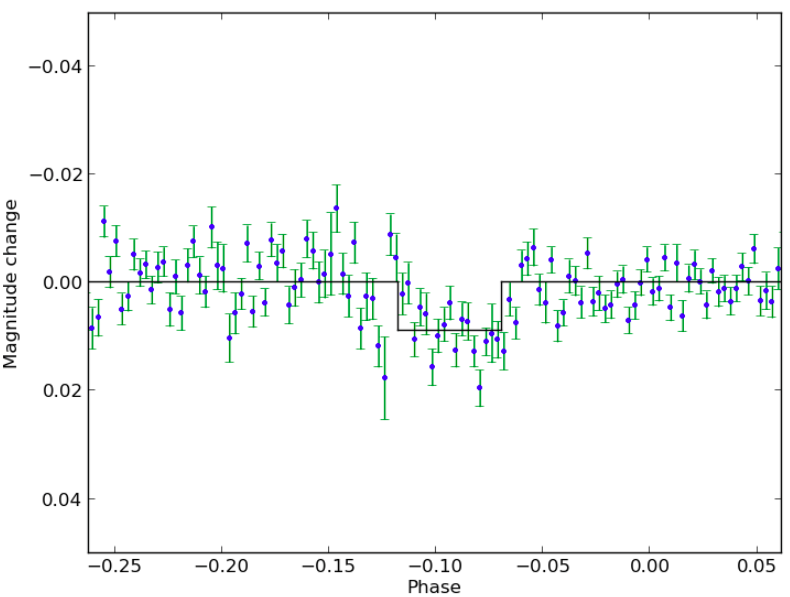 Equally puzzling is the transit light curve for CoRoT-29 b (shown below at left). Most transit curves are u-shaped, but CoRoT-29 b’s is strangely asymmetric. The asymmetry resembles what has been seen for a planet transiting a rapidly rotating star — rapid rotation reduces the gravity at the stellar equator, resulting in a cooler, darker region. Barnes et al. 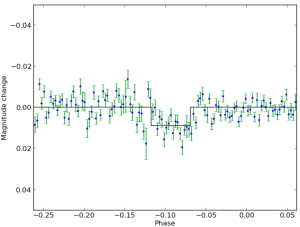 (2013) looked at the transit light curves for such a Kepler system and actually used the light curve to study the planet’s orbital inclination. 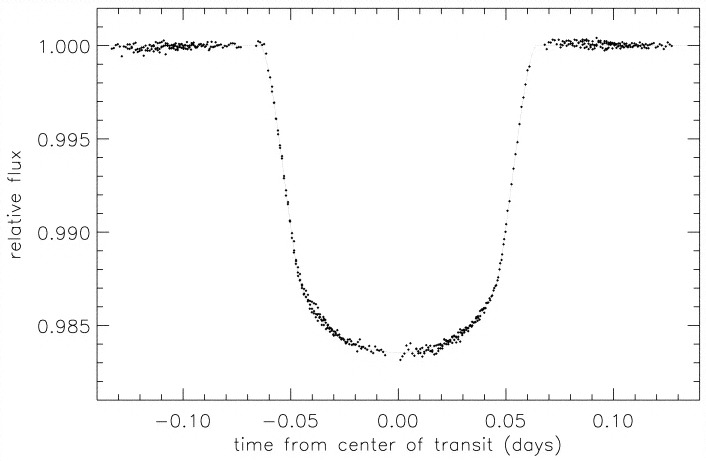 (left) CoRoT-29 b transit light curve. (right) Planet transiting star spot. But CoRoT-29 doesn’t appear to be a rapid rotator. So instead Cabrera et al. suggest that perhaps the star has a large, nearly stationary star spot and that the planet transits the spot over and over again. However, this scenario would require a nearly stationary spot with a very long lifetime (~90 days), neither of which is expected. So a few more astrophysical conundra to add to the growing list of puzzling exoplanet discoveries. Journal club attendees included Jennifer Briggs, Emily Jensen, and Hari Gopalakrishnan. Posted in: BSU Journal Club. Tagged: astronomy, exoplanet transit. Phase-folded and phase-binned light curve for KELT- 3, from Zhang+ (2015). At research group meeting on Thursday, we discussed a recent paper by Zhang and colleagues that investigated the performance of Canon’s EOS 60D and whether it was suitable to use for precision photometry to look for exoplanet transits. Although the authors found the camera exhibited a few peculiarities (that are apparently not described in any of Canon’s documentation), they showed that it could be used to observe exoplanet transits — a really great result. It means that astronomers, amateur or professional, who want to do transit observations don’t need to spend $10,000 to buy a high-end CCD camera. Instead, they can spend just a few hundred to produce reasonable quality transit light curves. One especially tantalizing result from the paper: Zhang and colleagues mention having seen exoplanet transit-like signals for four of the target stars they studied, only one of which is known to host a planet — KELT-3 b. That means they may not only have recovered known transiting with the Canon EOS 60D; they may also have found three new ones. Presumably, they’re in the process of trying to confirm whether the other three are new planets. UPDATE: The authors kindly updated me to say that follow-up observations indicated these three candidates are all false positives. But they would have discovered KELT-3 b with their survey, if it hadn’t already been discovered. So a pretty amazing achievement. Attendees included Jennifer Briggs, Andrew Farrar, Nathan Grigsby, Emily Jensen, and Tyler Wade. Posted in: Journal Club. Tagged: exoplanet transit, exoplanets, Kepler mission. At Friday’s journal club, we discussed on two papers. The first, Webber et al. (2015), investigated the effects of clouds on the phase curves for hot Jupiters. Webber et al. found that planet’s phase curve may depend sensitively on whether clouds are distributed uniformly or heterogenously throughout the atmosphere. They also found that the amount of light reflected by an exoplanet depends on the composition of the clouds — clouds made of rocky minerals like MgSiO3 and MgSi2O4 are much brighter than Fe clouds. 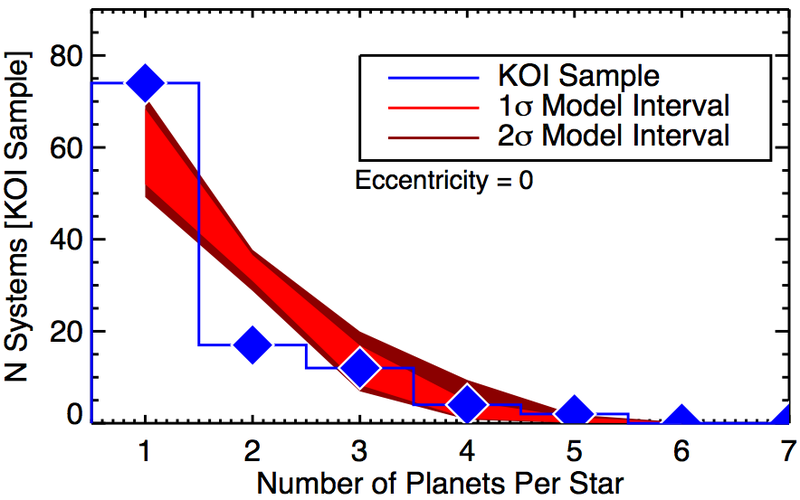 From Ballard & Johnson (2015), this figure compares the number of stars with a certain number of planets detected by Kepler (blue diamonds) to our expectations (in red) if single planet systems actually had more planets hidden from Kepler’s view. The disagreement between the blue and red curves suggests that many of those apparently singleton planets really are only children and single and multi-planet systems are inherently different. The second paper, Ballard & Johnson (2014), investigated the frequency of exoplanets around M-dwarf stars observed by the Kepler mission. Because the Kepler mission found planets by looking for transits, there’s always a good chance that a system with only one detected planet actually has more that just don’t pass in front of their host star as seen from Earth. But we know exactly how to account for this geometric effect. By accounting for it, Ballard and Johnson showed that Kelper actually found a lot more systems with only one planet than we would expect if there were just more planets in those systems hidden from Kepler‘s view. So there are two distinct kinds of planetary systems around M-dwarfs: those with only one planet (or possibly several planets with large mutual inclinations) and those with several. Why the difference? Ballard and Johnson find tantalizing hints that stars hosting only one detected planet are older on average. One simple explanation: given enough time, systems with many planets become unstable, and the lonely planets we see today originally had siblings that were gravitationally cast out of the system, to wander the void between the stars. Or the siblings were accreted by their parent stars, like Saturn eating his children. Along with many others, this study helps show that planetary systems can be much more violent places than astronomers originally thought. Journal club attendees included Jennifer Briggs, Nathan Grigsby, Jared Hand, Tanier Jaramillo, Emily Jensen, Liz Kandziolka, and Jacob Sabin.